Today I am excited to announce that Katy O’Brian from the hit show Z Nation has agreed to share her success story. Katy O’Brian Discusses Her Role as Geoge on Z Nation and Success. The following is a transcribed interview, with minimal editing to preserve tone. My questions/comments are in bold, Katy’s follow in plain text. Katy O’Brian is an actress, martial artist, figure competitor and a former police officer from Indianapolis, IN. She started her acting career in local theater productions at a young age but had always had a passion for film and television. Katy’s first booking was a recurring role on AMC’s The Walking Dead, followed immediately by her first LA gig on Comedy Central’s Tosh.0. Those were succeeded by stints on the hit series Halt and Catch Fire on AMC and How to Get Away with Murder on ABC, leading up to her series regular role as George on Z Nation on SyFy. Her real-life experience as a street cop, mixed with her strong martial arts and ability to bring a character to life will have you seeing plenty more of Katy on the big and small screen. Can you tell us a little bit of background about how you got started in acting? Yeah, yeah. Sure. I mean, I’ve been with different talent agencies ever since I was a little kid, but I was never really, in Indiana, somebody that was very easy to promote, I guess, especially 20 years ago. I didn’t see a lot of success as a child in the industry, especially in the Midwest. So I kind of put it on the back-burner, thought it was just something that I would never be successful in. I was doing police work for a really long time before realizing that even though, you know, in the Midwest we promote having a really solid career and a really stable career, I realized that I wasn’t going to be happy until I pursued what I’ve always wanted to do, which was act. So I wound up finding an acting class, taught by Jim Dougherty, in Indiana, that actually focused on film acting. Which, in the Midwest, was really, really difficult to find. He went over some basics of technique, but his goal is to obviously make a performance as natural as possible, which I really liked. He also went over the business of acting, which is one of the most important things that I found in terms of actually being able to go out and book jobs. So, he talked about, what a good headshot looks like, how to do a self-tape audition. Because most auditions now are done, at least at first, in your own personal auditioning room or one that you have to pay for or whatever. So, you self-submit auditions with a videotape and then they might call you back in for a callback, or you might just book it off the tape alone. So, learning how to do that was super important, how to submit to agencies, all of that. So, with all of that I was able to network with some Indiana filmmakers, and since it’s a really small community I was able to build a really solid reel, submit to agencies, and I wound up getting with Laureen who was my agent when I first got to Los Angeles, and now, she’s a manager. Ever since then it’s just trying to maintain the hustle and auditioning for pretty much everything that I am asked to audition for. I will do my best for each one, and I’ve found that to be incredibly important. And it’s been working out so far. It’s actually very random. I mean, ideally, I try to go to the gym first thing in the morning with my girlfriend before she goes to work. And after that, I always eat breakfast, and it’s pretty much the same boring breakfast every day. It just makes it easier for me. I do a little bit of light business, check emails, respond to anything that needs to be responded to right away. I might schedule some appointments or whatever, but I don’t like to delve into the meat and potatoes of whatever project I’m working on for the day right away because I have a short period, between my first workout and then going to train. So, do a little bit of stuff after the first workout, and then I train martial arts of some kind in the afternoon. And then after that, I’m pretty much free for the day to work on a pitch deck that I’m working on right now for a project with my manager, any auditions I might have. I’m also trying to put together a blog of just basic acting resources that people who might be starting can check out. Just, some books, mostly books, websites, podcasts and stuff that I’ve found helpful or other people that I’ve talked to have found very helpful. Yeah. I think the worst thing I ever did was not believing in myself sooner. Just filling my head with just toxic thoughts. I think that was the biggest waste of time ever. Just sitting there telling myself I wasn’t good enough to be an actor, I would never be good enough, I could never be successful in Los Angeles, any of those things. So it was just the worst thing anybody can ever do, and it’s not beneficial to be productive in any field, whatsoever. Looking back is there anything about the industry that you found surprising? I actually found out that a lot of agencies and production companies, and especially top agencies, kind of work together. So agencies might even own portions of productions companies or, depending on packaging deals, they might already have what actors they’re going to have for whatever lead roles, lead parts for their shows. So it was actually a huge surprise for me to learn that some of the bigger jobs, and even some small jobs, are reserved for people in big agencies, period. No matter how talented you are, no matter how much you put yourself out there, there are some jobs that you literally will never see, have access to, or even be considered for. What advice would you have for somebody that’s trying to get started into acting? I think one of the biggest things that they should do is focus on learning the business of acting because it’s not just an art. You can be amazing, phenomenal at acting, but if you don’t know what your brand is, how to promote yourself, or how to make the connections, you’re not going to get yourself out there. So, learning the business is super important. Learning who you are is very, very important. There are a lot of people that seem to think that they’re a leading man, for instance, when they’re really a character actor. That’s not something that should discourage you, that’s something you should embrace. There are so many roles for character actors out there, yet so few for leading men. I think the more you know who you are, how to market yourself, and what the business is looking for, the more successful you’ll be in the business. Do you have any books you would recommend for aspiring actors? I have a few that might be helpful. Jenna Fischer, from The Office, she just put a book out called “The Actor’s Life: A Survival Guide,” and it is one of the best overall books on acting I’ve ever read. And it has nothing to do with technique. I mean, you either figure that out or you don’t. She points out traps people fall into, like casting traps. Like she wound up kind of, almost auditioning for what might have been some kind of adult film or something like that. She found out, “Okay, this is a casting trap to avoid.” She points those business traps out. Picking your headshot because you think you look great in this picture and everyone else thinks you look like an idiot, that kind of thing. The basics of auditions, callbacks, chemistry reads. A lot of people don’t even know if they have not yet made it to a chemistry read, they don’t even know that those exist. Getting fired from acting jobs. She just, it’s a great book that starts from the very basic of like, “You have decided to step foot in the industry,” to, “You’ve succeeded and now here’s what you do after that.” And there are very few books that cover what happens once you’ve succeeded in the business, so I think that’s amazing. There’s an old book called “ACTION!” by Robert Benedetti. I would say anybody who has never set foot on set before would find this book very helpful. It just goes over certain camera tricks and even though you think you’re going to be looking at the person that you’re talking to, depending on what the camera angle is or the length of the lens or something like that, you might be staring off in space somewhere. So, it’s little things that people might not consider, think of, or know if they’ve never been on a set. So this book, “ACTION! Professional Acting for Film and Television“, it’s great for people that have never experienced that and are about to set foot on set and are terrified. Do you have any particular tricks to how you manage time? Oh, yeah. I am … I’m terrible at time management, so I have had to trick myself into being productive. I get very, very distracted very easily, so … Especially if I have my phone nearby. It’s a catch-22 because if I ditch my cell phone, I might miss out on last-minute auditions, which I get kind of frequently; where I have to be at a location in like two or three hours. So I do need to have the phone near me, but I try to make it inconvenient for me to access. Then the other thing, too, is getting out of the house. I feel like if I stay at home, connected to my internet, I’ll just start going on the web and fall down the loophole and get on YouTube and wind up watching videos of otters for hours or something like that. So, I feel like if I go to a coffee shop or out in public somewhere, library, I kind of can trick myself into feeling like people around me are holding me accountable for doing the work that I need to do. So I mean, that’s the main couple tricks, I guess. I’m a big Greek mythology nerd; there’s an inscription on the Temple of Delphi that says, “Know Thyself.” It’s one of the first big Delphic Maxims. Knowing yourself, who you are, what you bring to the table, what your insecurities are, any of those things I feel is of the utmost importance for anybody. It could help you get through any hard times. I had a guitar teacher that gave me a great tip, that I’ve taken to heart. It was that “You cannot be responsible for someone else’s happiness, but you are responsible for your happiness.” I used to waste a lot of time and energy trying to please everybody else and not focusing on myself and what makes me happy. I want everyone to find happiness, I want everyone to feel loved and everything like that, but I also need to realize, I need to hear that that is not my responsibility. I cannot control how everyone feels around me, but I can control how I feel, and I can’t blame anyone else if I’m feeling unhappy or anything like that. So it’s kind of a power dynamic. I don’t have the power to control anyone else’s feelings or emotions, nor should I. They, in turn, do not have that power to control mine. That was an empowering and freeing little piece of advice. I have to ask you about George. We’re huge, huge fans of the character. How much of her character represents you, how much is writing, and how much is acting? So it was one of those roles where it was the least surprised I’ve been to have gotten a role because it just really felt like I was portraying someone who I understood very well. And as time goes on, they do let you, you know, they do write the character towards you, for you a little bit. I wanted a few more actions scenes, which they were very happy to grant, you know, once my ankle started to heal up a little bit. I thought George wasn’t very funny at first and I wanted to do a little bit more, incorporate a little bit more of a sense of humor. I mean, I’m kind of a dork. So I do kind of come off as funny just by my awkwardness alone, I guess, sometimes. But I wanted to toss a little bit more maybe of my, I think, Irish humor in there. Being able to rag on people and be ragged on a little bit. I didn’t realize they worked with you like that. He met with me, listened to me, and then we sat down for three hours, and I do feel like he heard what I had to say. He also, educated me a little bit about what he was trying to bring to the table with those messages and we were able to, see eye-to-eye. I was able to see what he was going for and I think he understood what I was going for in the end. I’m thrilled with how George winds up at the end of the show and, much stronger and not necessarily so reliant on other people to convince her that, of how she needs to behave and that she needs to lead, I guess. Oh, thank you. I love her. She is a dream role because it’s kind of your typical male journey that I get to play and put a little bit of a feminine twist on it. I know that I kind of come off as androgynous or masculine or whatever, but it’s so great to see that they’re casting women in roles that originally would be cast or reserved for men. And I, I love that. The fans love it too, she is fantastic and doesn’t fall into the tired clichés. Right. Yeah, I totally understand where you’re coming from there. It’s just, it’s … Have you ever heard of the Houseplant Analysis or something, Houseplant Theory or something? So, it’s, “If you can replace a character with a houseplant and it doesn’t change the story at all,” it doesn’t pass this test, right? This Houseplant Test. There are so many female characters, unfortunately, that are put into shows just to, as you said, represent this dynamic or this whatever. And they’re put in the show, but they’re not given any purpose in the show, and so it just really takes away from that character. It really does a disservice to that character. And so they do not pass the Houseplant Test. Like you could replace them with a plant, and it’s the same show. And I’m very glad Z Nation did not do that. Was it difficult to step into an established show like Z Nation? So there was like that little voice inside my head that I need to try to shut off as much as possible. But you know, even so much as the plane ride to my first wardrobe fitting, I was on the plane, and I look up two seats in front of me, and I’m like, “I think that’s Kellita Smith. I’m like almost 100% sure.” And I’m just like, “There’s no way we’re on the same plane. Okay, I guess the odds work in our favor. Maybe she’s got the same meeting I do.” So I said her name and she turns around, and she’s already got a smile on her face, she just loves meeting people. And I said, introduced myself, and I said, “I’m playing George.” And she just gave me the biggest hug, was so excited. And that was my first, you know, intro to the show. He comes up with some awesome dishes. Like we might go to a restaurant now and then, and he’d be like, “Oh, okay.” And a couple of weeks later, that dish is being served, home-cooked, in front of you, and it’s better, if not the same, as when you ate it out. Yeah. He’s so great. And Keith, he met up with me one of the first days I was there, got our breakfast together. Nat and Gracie were very warm and welcoming. Anastasia and I hang out now all the time. I mean, everyone was just so loving, so welcoming. The crew, the directors, it just felt like, you know, they welcome you in the family right away. And even the guest stars feel that way. It’s just a very loving space, welcoming environment. I get that sense from the community, everyone involved on the show has the nicest things to say. We love that too, I was so thrilled, so happy. You know, Russell was telling me that, the Z Nation fandom, he’s like, “We have the best fans. We have the best fans.” And he just kept saying that. And yeah, now they’ve started to message or chat with me or whatever, and it’s all been positive. Speaking of the fans, so Brian Z, he sent me a couple of questions he wanted me to ask. So I want to give him a shutout and ask one of his questions. Ha-ha. I believe I have answered that publicly, but yes, Keith Allan is gorgeous. There’s something about his red look this year that is like; it’s just stunning on him. And he’s got these bright eyes that catch the light, just insanely well, and they sparkle. Yeah, to answer that, Keith is a beautiful, beautiful man. So, I know you’re a real-life badass, you don’t just play that on TV. How important is fitness to your success? It’s like, you know, it’s 100% must. Physical fitness, for me, especially with my brand, is an absolute, like must-do. So even just for the brand that I’ve created, just for my look, I do need to be physically fit to get the parts that I’m going for. I love doing action, doing martial arts stuff on film. It was so much fun. The fight scene that we just put out for episode nine, we did the choreography for that, like 30 minutes of practicing or something before we shot it, that’s it. You can show me a set of moves, and I can memorize it so much faster than I can language, right? So, it just comes to me a lot better than lines. Is that a talent you learned and honed or genetic? I think it’s a little bit of genetic talent. My dad was an all-state wrestler; he was a semi-pro football player. I’ve grown up in a physical environment my whole life. My brothers were all athletes. I have three older brothers, so I had to learn to defend myself at a young age. I had to stick up for myself. Just being involved in physical activities my entire life, I do think it teaches your body how to do that, as you continue to practice it, you get better and better at it as you get older. So yeah, I assume it’s partially inherent, but a lot of it just that I’ve been, doing it my whole life. Is there something that you think commonly inhibits people’s success? I think that just being incredibly negative all the time inhibits success for people. And on social media, that looks like, you know, dissing movies or talking about how bad a TV show is or something like that. You never know when you’re going to have an opportunity to work with somebody who produced that project or wrote that project or something like that. And if they see you on social media dissing one of their passion projects, that’s going to look bad on you. Hanging out with friends who talk about how hard and demoralizing the business is all the time. If the top five people that you surround yourself with are always bringing you down, continually surrounding you with negative energy, that’s what you’re going to show when you walk into an audition room. That’s what you’re going to present to people when you introduce yourself on the street. You’re just going to be this very negative presence that people don’t want to be around. So really, I think, finding ways to surround yourself with people who are being proactive, who are excited about what they’re doing, who are creating projects. That’s another thing in this business, maybe you don’t fit the brand, perhaps you don’t have enough experience to audition for a great show or something like that, but you can most certainly make your own materials. You can cast yourself in your project, and that way you’re still creating, you still have opportunities to show off your work, to show off your skills, what you can do. You’re building a reel for yourself. Sitting around and waiting in this business is one of the biggest things, I think, that people do that inhibits their success. How is social media impacting the industry? Going to the social media thing, I just read an article in Hollywood Reporter about somebody who lost their job on, I can’t remember what show it was. But he, years and years ago, created something racist. Years ago. And they found out about it, and he had booked the job, and they had to fire him. Because, they’re like, “I’m sorry, we can’t … We cannot have you; I can’t look at you the same. Especially not in this role, knowing that that was a belief or opinion that you had. And it was painful for everybody because he was a great actor and he apologized, he admitted it was a stupid thing to say, all of that stuff. But it’s just one of those things. You have to be careful with what you say. It could lose you a job that you’ve already booked. Yeah, and that’s good advice, especially for young people. The more time you waste, when you’re young, on just dicking around, not thinking about what you want to do, that’s just time that you could have spent literally learning how to rule the world that you just wasted. Depth perception and your reflexes and coordination– a lot of that is something that you learn at a very young age and really cannot teach yourself to the degree that you might want to be very successful in anything physical, for instance. You can’t teach yourself depth perception and balance once you get older. It’s something that you’re either going to have developed early on, or you did not. So a lot of parents, if they’re keeping their kids inside, not having them do athletics, things outdoors, they’re really, really reducing their kids’ ability, like their physical ability that they won’t be able to have later on in life. And it’s crazy to me. Since you were a police officer, what’s the best police comedy? Oh, man. Ah, there are so many good ones. Yeah, but is there one, you watch it, and you’re like, “Yeah, this is kind of what it’s like,” even though it’s a comedy? Well … Yeah, yeah. Super Troopers, for sure. I know that that’s ridiculous, but when I saw the movie for the first time I wasn’t a cop, and I was like, “It’s a stupid movie.” And when I saw it after becoming a cop, I was like, “Yeah, that’s kind of … Sometimes stuff like that happens.” But when I first think about like some of the ones that made me laugh, Leslie Neilson, his Naked Gun, or Police Squad. Police Squad was the TV show that came out before Naked Gun, and that is hilarious. It’s so ridiculous. Love that representation, too. 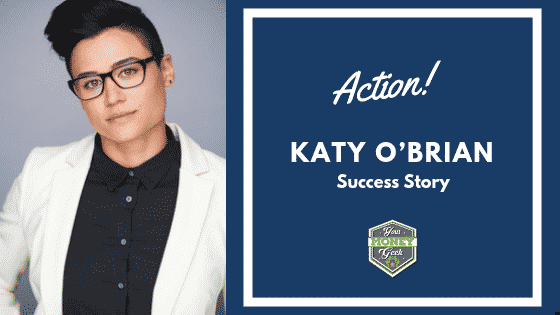 Thank you, Katy, for sharing your success story. If you are not currently watching Z Nation, please take an opportunity to check out the show, it is fun and well-written with great characters. Please take a moment and follow Katy on social media. Today, I am excited to share a fun success story. Russell Hodgkinson, “Doc”, from the hit show Z Nation has agreed to share his story and some valuable life lessons. Real People Success Stories Russell Hodgkinson My questions are in bold, Russell’s follow in Plain text. Can you tell me about your background? Writer and producer Hilton Ariel Ruiz talks about his upcoming movie Zombie with a Shotgun. Learn how he used social media to connect with his audience. Hilton Ariel Ruiz: Zombie with a Shotgun My questions comments are in bold, Hilton’s follow in plain text How did you get started?